Europeans have strict standards for motorcycle protective gear, including gloves. The applicable standard is EN 13594:2002 (there is a dizzying array of "acronyms" doing the testing and advising, and promulgating an even more dizzying array of standards with lots of letters and numbers). To see how your favorites might stack up, here's an intro to the glove standards from SATRA (one of the acronyms). You can also read a bit about how they're tested from this lab. Talk amongst yourselves whether all this is necessary, but hey, it's always nice to feel like someone (even a big bureaucracy) is looking out for we motorcyclists' safety. 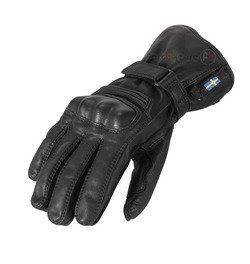 By the way, Swedish company Halvarssons sells the "Safety Grip" glove (shown below), which is the only one I've found so far that claims to meet EN 13594. If you've never heard of Halvarssons, here's a slick little video introduction.